Engineering Village takes engineering research to the next level with a comprehensive database that includes the most authoritative engineering resources available to answer today’s most timely questions—from theoretical to applied, and basic to complex. Whether it’s preparing for a paper, a grant or funding proposal, a request for new research allocations, a detailed patent application, or simply an interest in acquiring new engineering knowledge, Engineering Villages provides the most comprehensive information you need. Demystify your school's engineering research landscape with the Engineering School Profile. 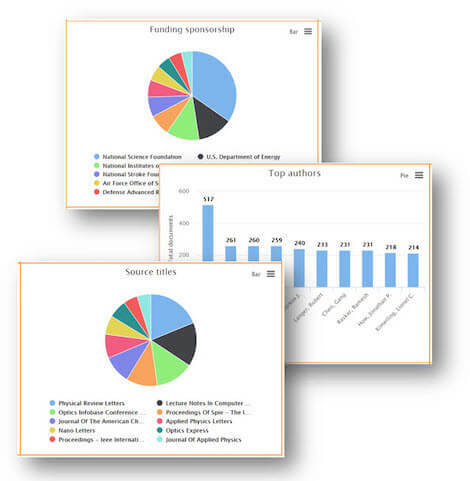 View your school's research output in one visual & customizeable interface. Make better decisions regarding grant allocation and research strategy. Academics, government institutions, business researchers and practicing engineers gain an immediate advantage with access to today's most authoritative engineering research, with enhanced user features, that provide deep insight into published engineering work and related disciplines. Engineering Village offers access to 12 engineering literature and patent databases providing coverage from a wide range of trusted engineering sources. The databases have been carefully selected to provide both breadth as well as depth of content. See how Charleston Review, a critical publication for information professionals, evaluates Engineering Village.